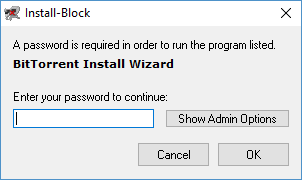 Install-Block password-protects the installation of new software and locks down existing software of your choice. Password-protect these actions for increased security or productivity. Ideal for employers, parents, and any shared/public environments. 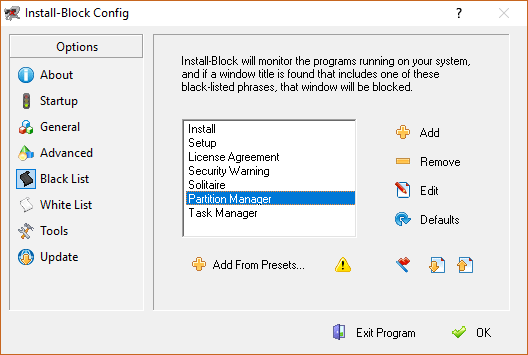 Whether you need to restrict access to sensitive software, prevent employees from wasting time on Solitaire, or are concerned about a child installing unknown programs, Install-Block offers an easy solution. Prevent users from accessing the Start Menu, Task Manager (Ctrl+Alt+Del), Control Panel applets, program settings, or other sensitive features. Have multiple computers to protect? Here are some more benefits for companies and organizations. Licenses for multiple computers are substantially discounted versus the base price. The more PCs you have, the larger your discount. Get a quote. 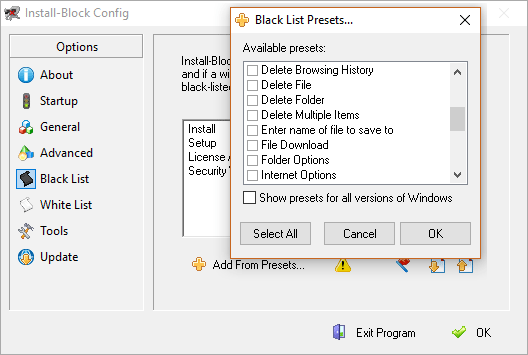 Install-Block makes it easy to copy program settings onto all of your networked computers at the same time. You can also view logs or enable/disable the software on each PC. Administrators can remotely grant or deny access to a blocked program on a networked machine. You can even grant someone one-time access via phone or email, using a generated code specific to the action they are attempting. Some of the world's largest & best-known companies rely on Install-Block. Our software is trusted by Fortune 500 companies, renowned universities, countless small businesses, and many parents. Give it a spin and see if we can meet your needs as well. Important Note: In this evaluation version, all password prompts will allow the password of "password", and users are informed. This makes the demo useful for evaluating the effectiveness of the software, but does not provide any real security. We provide secure ordering through PayPal. A PayPal account is not required - you can also select to pay via credit or debit card. Multiple computers? Get a quote.